The revised estimates for the flow of oil from the Deepwater Horizon (DWH) well have continued to increase. The volume that is being captured daily has apparently stabilized, at the capacity of the Enterprise, which is collecting it. For the first 12 hours on June 13 (midnight to noon), approximately 7,720 barrels of oil were collected and 16.9 million cubic feet of natural gas were flared. On June 12, a total of approximately 15,040 barrels of oil were collected and 32.9 million cubic feet of natural gas were flared. But the doubling of the flow estimates have caught everyone’s attention. Certainly looking at the amount captured on video seemed to show a significant reduction in the amount that was leaking out of the bottom of the cap, but if the vents remain open (and I have seen one that still was earlier) then the amount that is not being captured could still be a significant percentage of the flow. The Department of Energy now has a website that shows a number of documents relating to the DWH site. 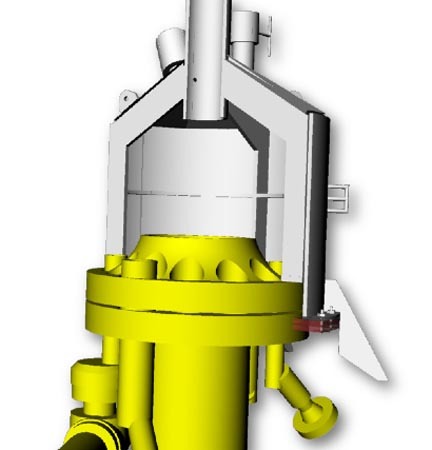 They include this graphic that illustrates the relatively tight fit of the cap around the riser. Below the fold I’ll talk about the BOP pressure measurements and Top Kill. Oh, and a little bit about money. I had hoped that would give more of an illustration of the flow path through the BOP but it doesn’t show anything that hasn’t been posted here on that issue, at least as far as I can see. What it does have, however, is a table that shows the measured pressures at different heights within the BOP, as of 25th of May. There are also more details of the steps in the Top Kill Operation. Which actually raises a couple of questions. 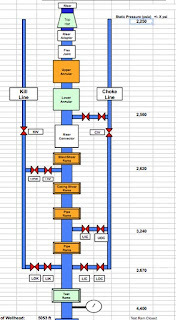 A flow of 17,000 bbl/day is 12 bbl/minute. If I remember there were at least a couple of statements that implied that they had stopped the well flowing oil, and brought it into some sort of balance. One wonders if that were true, and for which, if any of these tests that was accurate. 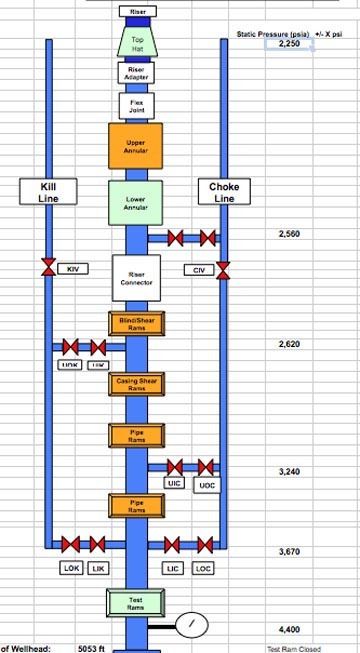 The reason for the question, going back to the post I wrote on why Top Kill might have failed, is that the bottom of the drill pipe is 3,367 ft below the BOP. While injecting “junk” to seal the well might have had some impact on the annulus around the DP, unless they could first carry the sealing particles down to the bottom of the DP, and then have them be carried back up the pipe, they couldn’t seal the leak in the crimped BP. (And that depends in part on the specific gravities they got in the admixture going down the well). The effectiveness also depends on the size consist of the bridging materials. The higher numbers now being quoted have led the Coastguard to demand a better plan for dealing with the spill. The Coast Guard has told BP that its proposed plan for containing the runaway Deepwater Horizon well does not take into account new higher estimates of how much oil is gushing into the Gulf of Mexico. The Coast Guard demanded that the company provide a more aggressive plan within 48 hours. And that time is about up. He (President Obama) said US Energy Secretary Steven Chu was leading a team of "the world's top scientists, engineers and experts" in devising a contingency plan should the "top kill" attempt fail. The Administration plan, at the moment, seems to be to get as much cash out of BP as possible, as soon as possible. In an effort to seize greater control of the gulf oil catastrophe, President Obama is prepared to compel BP executives to set up a multibillion-dollar escrow account to pay damage claims in the region, a senior White House official said Sunday. . . . . . . In a letter to BP Chief Executive Tony Hayward on Sunday, 54 senators, nearly the entire Democratic caucus, called on the company to set aside $20 billion for cleanup and damages, to be administered by an independent trustee. But as far as BP coming up with a new plan . . .
Jon Pack, a BP spokesman, said Sunday that the company would respond in a "very timely manner" to the Coast Guard's demand to come up with a better plan to contain the oil, but he added that the company would not make the plan public. BP's board of directors was scheduled to meet Monday, according to Pack, who would not divulge the agenda. Given that BP has about $7 billion in available cash, with a number of other obligations (the fine for the spill for starters) there comes a point where even with the best will in the world, BP is going to run out of the cash that more and more folk are demanding. For example the Administration is now demanding that BP carry all the folk that have been put out of work by the drilling moratorium. A ban on deep-water drilling is set to continue for six months. 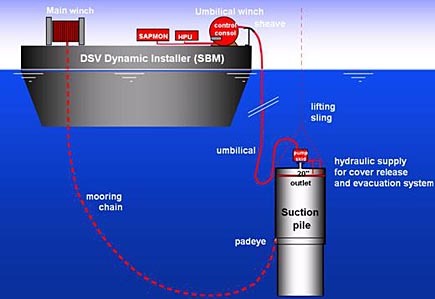 Salazar has said companies will be able to drill in water depths less than 500 feet once they comply with newly issued safeguards and other yet-to-be-unveiled rules for exploration plans and environmental studies. But it could take weeks — or months — for companies to make the changes and federal regulators to approve them. You can’t comply with “yet-to-be-unveiled rules” until they are unveiled. The impact of this is going to extend well beyond just the drilling companies themselves, BP has drawn a line over paying that at the moment, but we’ll see what pressure the President can bring to bear this week, when he meets with them. But I will close by re-iterating the concern that I expressed when I wrote about the Hurricane season approaching. The way that this is developing doesn’t bode well for the ability of the industry to be able to bounce back from any serious damage to Gulf rigs following a Hurricane, of the sort we saw in 2005. If the Gulf supply is compromised, and unable to recover because of regulation, this could be a very interesting election season. And one last thing, for those who wondered what a suction pile is, since one has just been fielded. Here is a graphic, showing you how it is used. I visited the DoE website: www.energy.gov/open/oilspilldata.htm and found "Oil and Gas Flow Data" for recovery of spilling oil by the LMRP/Cap#4 system to the Enterprise drill ship. However, I could not understand the following terms used for temperature or whether these terms apply to oil collected at the surface or oil collected at the wellhead. The terms are: "WHTemp" and "WHDCTemp". Thanks for any light you can shed on this topic.